What Is HardiPlank® Lap Siding, and Why Should You Trust It? You are here: Home / Siding / What Is HardiPlank® Lap Siding, and Why Should You Trust It? At Twin Cities Siding Professionals, we only offer our customers the products we completely trust. We install only one kind of siding: James Hardie® HardiPlank® Lap Siding. In this post, we explain why we believe in James Hardie HardiPlank Lap Siding and why you should, too. 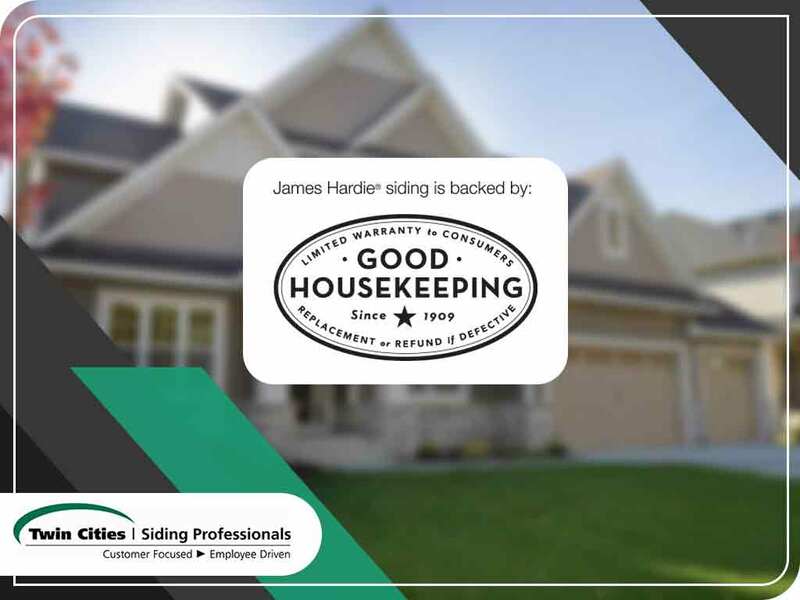 Our siding product proudly bears the Good Housekeeping Seal of Approval. Only products that represent value and quality carry that seal. But what is HardiPlank Lap Siding, and why does it deserve the Good Housekeeping Seal of Approval as well as our trust? James Hardie boasts some of the best fiber cement siding products. HardiPlank Lap Siding comes from that storied line and is one of the most popular in the area. Over 5.5 million siding installations across the U.S. involve fiber cement siding, such as HardiPlank, a testament to how fast this type of siding is growing. James Hardie is proud to be the pioneer and the undisputed leader in the manufacture of fiber cement. In the Minneapolis/St. Paul region, Twin Cities Siding Professionals is the best contractor to hire for HardiPlank Lap Siding installation. HardiPlank fiber cement siding is resistant to moisture and decay, insect infestation and fire. With such qualities, it is perhaps the most reliable siding material you will find, almost as enduring as brick, so you can be sure it will protect your home from the elements, including hail and snow. HardiPlank looks just as good as genuine cedar, and you’ll enjoy its soft wood grain features. The difference is, your HardiPlank siding will keep looking great long after real cedar siding panels have begun to show their age. You can paint your HardiPlank as it’s already primed for that. However, if you want a specific color right off the shelf, you can rely on James Hardie’s ColorPlus® Technology. ColorPlus ensures your siding doesn’t peel, crack or chip. HardiPlank Lap Siding is one of your best options if you ever decide to get new siding for your home. When that time comes, talk to us. You can also rely on us for siding repair. Call Twin Cities Siding Professionals at (651) 967-0873, or ask for your free estimate here. Twin Cities homeowners have trusted us for a long time, and you should, too.